These quality throwers are custom designed by master knifemaker, Gil Hibben, who has been making and using throwing knives since 1965. The Hibben Thrower is based on Gil's own karate knife design which also doubles as a functional hunting knife. Each knife features one-piece, 420 J2 stainless steel construction, and is perfectly balanced to assure uniform rotation when thrown properly. Each comes complete with an American made leather sheath. 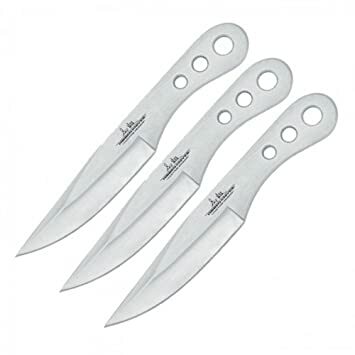 Includes three throwing knives (6.125" overall. 3.125" blade which is 0.16" thick) in a sheath designed to hold them all. Made in China.